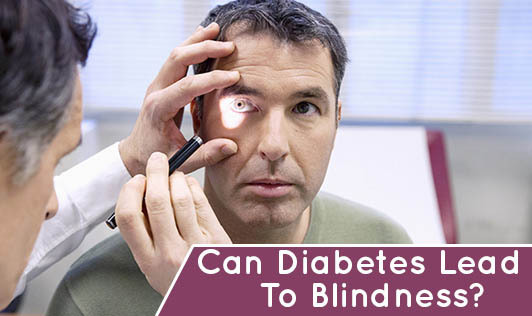 Can Diabetes Lead To Blindness? A damaged retina with long term diabetes is called diabetic retinopathy. Retina is a thin layer of tissue which is behind the inner eyes. A person with diabetic retinopathy will usually have a symptom of blurred vision. Most often diabetic retinopathy has no major symptoms at an initial stage. If any blood vessels are blocked. One should keep in mind that any treatment for diabetic retinopathy cannot reverse the damaged retina. It can be only maintained at this stage. Laser surgery can be conducted to prevent further damage. Bleeding from the eyes needs a different surgery which avoids more damage to the eyes. Drugs can also be given. The type of treatment is decided by a doctor depending on the symptoms. But the best treatment is to control diabetes by controlling blood glucose levels. To stop smoking and alcohol is a major step to avoid any complications in diabetes. Talk to your doctor and dietitian to know more about diabetes, its risks and ways to control it.